With the build of the first boat now all but complete, the main jobs remaining are the interior fittings (including electrics) and the all-important paintwork. The keel and rudders are being fitted at present, and we’re looking to complete in mid-April 2014. 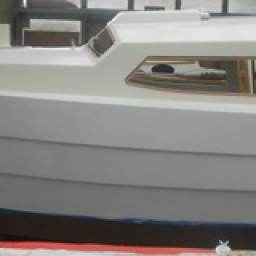 This boat’s hull has been constructed from epoxy ply, but the intention is to continue in GRP, for which we have some orders. We’re really pleased with how the first boat has come along and we’re looking forward to the future with the BayCruiser 26 being an important member of our range of boats. Have a look at our Facebook page for regular updates and photographs of the details of the final stages of the first BayCruiser 25 as she takes shape, and our other news and events. You don’t need to be a member of Facebook to look at our site, just click on this link https://www.facebook.com/SwallowBoats and you can see what we’re up to!